It’s time to start thinking about bubbles for the holidays. 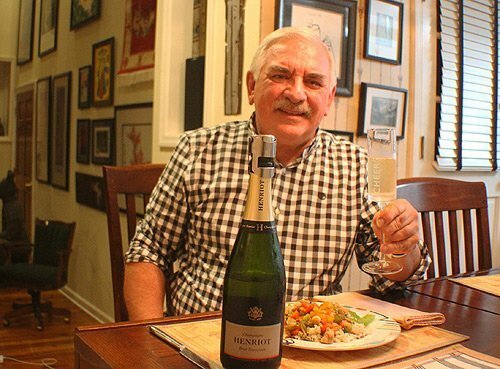 While I preach that we should drink sparkling wine all year long, the stretch from Thanksgiving, to New Year’s Eve certainly is the prime time for this festive drink. I like all versions, from Champagne to Prosecco to various Crements to Sekt to Cava and everything in between. If it has bubbles you start feeling good as soon as you hear that satisfying “pop” when you open the bottle. Each sparkler has its own charms, but I am always drawn back to the original, Champagne. 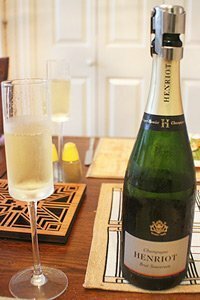 This Champagne Henriot Brut Souverein NV ($44-46) is one of the best, with a great flavor and a 210-year history. Just because something’s old doesn’t necessarily make it great, but when a winery has been making the same wine for 210 years, you know they must be doing something right. This Champagne has a rich, elegant style with a pleasant nose and complex fruit flavors. It is a gorgeous gold in the glass, with plenty of tiny bubbles, released over a long period of time. It has an elegant mousse, the froth that appears on top of the wine when you pour it. If you have never done it, take a sip before the foam settles down. It is a very pleasant sensation, especially with a great sparkler like Henriot. The best mousse has a creamy, stable feeling, which the Brut Souverain delivers. Describing the taste of Champagne is tricky, but I picked up some apricot, pear and green apple with citrus undertones. Everything is fresh and lively. There is some yeastiness, but not too much. This Champagne is pleasantly sharp with balance and harmony. The taste is dry, but not overly so. The feeling in your mouth is round and balanced. The aftertaste is long and pleasant, with some hint of minerals. Grapes for the blend come from throughout the region and include 30 percent reserve wines. The blend is 50 percent chardonnay, 45 percent pinot noir and 5 percent pinot meunier. The wine spends more than three years aging in the Henriot cellars in Reims (pronounced Rahnse). The prestigious Blanc de Blancs is 100 percent chardonnay and spends 4-5 years aging in the bottle. Most non-vintage Champagnes spend 18 months or less aging in the bottle. Winery: Champagne is a region full of good family stories and Henriot has one of the longest. The Champagne house started in 1808, but the story begins in 1794 when Nicolas Henriot, a wine merchant in Reims married Apolline Godinot, a local vineyard owner. After 14 years of marriage, Nicolas died leaving Apolline to become one of the regions’ famous widows. She founded Veuve Henriot Aine. The business has been in the family ever since. In 1850 the House of Henriot received a royal warrant from the king of Holland and the house became a supplier to the courts of Europe. The warrant was renewed in 1881. Other royal families also endorsed Henriot. Early in the 20th Century the phylloxera root louse devastated the vineyards in Champagne as well as much of Europe. World War I brought more destruction around Reims and the Champagne region. Etienne Henriot took over the company, and revitalized the vineyards. He also grew the house’s estate by buying vineyards all over the region. As he developed new export markets the business grew. After Etienne died in 1957, his son Joseph, a trained agronomist, took over the family company and continued its growth. He bought and sold vineyards and became involved in other prominent Champagne houses. In making fine Champagne the key person is the winemaker, who is responsible for recreating the house style year after year. The current cellar master, Laurent Fresnet, is a master of the art. He joined Henriot in 2006 and has won many awards since then, including International Sparkling Winemaker of the Year in 2015 and 2016. Besides the blanc de blancs and Brut Souverain, Henriot makes vintage Champagne, brut rosé and a prestigious Cuvee 38. This year Henriot expects to introduce two new wines: a prestige cuvee and the house’s 200th vintage, 2008, which is the first vintage Fresnet has overseen from harvest to bottle. Goes with: We had this fun wine with a chicken stir fry I have been making for 40 years. It was a great pairing. 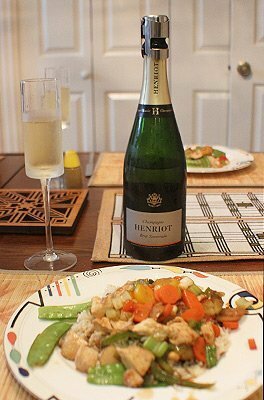 It can be difficult to find a wine that goes well with the spicy stir fry that includes fresh ginger, soy sauce and red pepper, but Champagne is a perfect match. The fine bubbles and crisp acidity cut through the spice and pull all the tastes together. It would be difficult to find a food that doesn’t pair with Champagne, from appetizers to spicy entrees to sweet desserts. In a wok or large frying pan, cook the chicken and ginger in hot peanut oil, 350-400 degrees. Remove the chicken when it turns color and add small amount of oil to the wok. Cook the vegetables in the oil for 2-3 minutes, starting with the carrots. Don’t let them get soft. Add the chicken back in and stir together. Add the sauce and cook for another minute or two to blend the flavors. I usually put the snow peas in near the end of the cooking. Serve immediately over rice.